Polo Piatti is an award-winning British-Argentine composer and concert pianist. Originally from Buenos Aires he started piano lessons at the age of 3 and became a successful concert pianist and classical improviser in his youth. At the exceptionally young age of 12 he was accepted with honours at South-America's prestigious conservatoire, te ‘National Conservatory in Buenos Aires’, Argentina, where he later graduated with distinction. Polo left Argentina at an early age to pursue an international career, continuing his studies in Paris and Berlin. He has worked in the UK and abroad as composer, concert pianist, arranger, musical director, conductor and lecturer. During his extensive touring as a concert pianist Polo Piatti became known for his ground breaking classical piano improvisations. Piatti also co-founded the pioneering drama school ‘Die Freie Kleintheaterschule’ with the late Frieder Noegge in Stuttgart, Germany, with whom he wrote and performed a variety of extremelly successful plays. After his move to the UK Piatti first worked as pianist and later as Head of Music at the Italia Conti Academy Of Theatre Arts in London. He left to become Director of Music for the newly founded ‘World Centre of Performing Arts’. As a composer Polo Piatti has written, produced and arranged music for numerous plays, films, dance productions and art installations. After spending several years in London developing artists and publishing his music, he returned to his roots of composing and performing his own music. His compositions are widely considered as highly emotional, evocative and passionate. Piatti’s latest CD ‘The Tides Of Time’ has been released worldwide to outstanding reviews. During 2011, Piatti was appointed Composer In Residence at St Mary In The Castle in Hastings, Sussex. In November 2012 he toured Japan, premiering his latest orchestral suite Sentimental Journey with the Osaka Concert Orchestra and giving classical piano improvisations concerts in both Osaka and Tokyo. In 2012 Piatti founded the world's first ever International Composers Festival in Hastings, England, with the aim of bringing together living composers and musicians from all over the world to premiere and showcase classical music of today that is melodic, tonal non-experimental and widely accessible. Piatti also founded the Hastings Sinfonia orchestra in the same year and is presently its Artistic Director. In 2015 Piatti finished two mayor works: the first ever multi-faith Oratorio entitled ‘Libera Nos’ commissioned by the ‘Musica Sacra’ organisation and also the 'Bohemian Concerto', his first Piano Concerto. 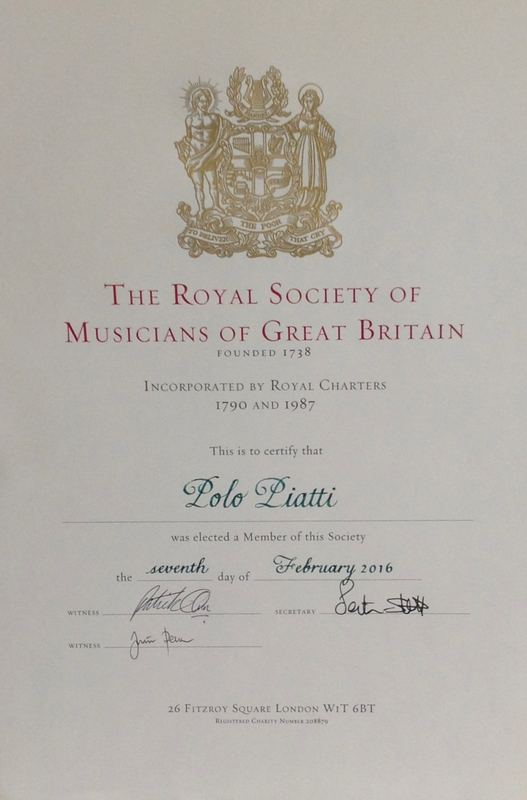 Polo Piatti is a Professional Member of BASCA, the Musicians Union, PRS For Music as also a Member of the Royal Society of Musicians of Great Britain.